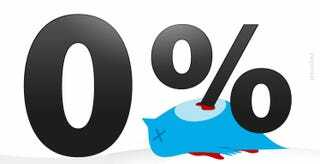 There may be plenty of ways for Twitter to make money, but it doesn't look like charging membership fees will be one of them: a recent survey showed that zero percent of users would pay for the service. Zilch. None. Zero. Nada. Zip. Zippola. Goose egg. This is fun! Of course, some people will pay for anything, Twitterati included. So 0% is as misleading as any other survey result with a wide margin of error. But a result so severe still indicates that getting a critical mass of people to fork over their ducats for the right to tweet is going to be nigh impossible. "Such an extreme finding that produced a zero response underscores the difficulty of getting Internet users to pay for anything that they already receive for free."